A copywriter's blind spot, or mine? But check out the description: "Shaped for comfort and protection. Concave shape minimizes pressure." Doesn't "concave" mean depressed, curving inward? 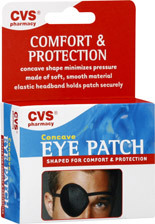 And wouldn't a concave eyepatch give the wearer a poke in the eye? I opened the box and found a satiny black Captain Hook/Hathaway Shirt-guy patch. And is it concave or convex? Trick question. It's aimed outward at the world in a perky point, like a junior Madonna's bra cup; I'd call that convex, reflecting the point of view of everyone who will see it in use. But it's also concave, if you're looking at the inner surface rather than the outer. I can see how it's fair to call it concave, since concavity is what matters to the eye it's protecting. But it would never have occurred to me to describe this item -- pictured on the box from its convex side, visible in use only from its convex side -- as concave. The word "concave" is only accurate from one point of (non)view -- that of the eye that's hidden in protected darkness. Even when that's my eye, I don't think I'm going to see it that way.